The International 420 Class in partnership with the Japanese 420 Class Association and the Organizing Committee of the 2015 420 World Championships hosted a 420 Coaches' Clinic from 9-12 April 2015. Fourteen coaches attended the clinic, ranging in age from 33 to 69 years old, representing a mix of experience from entry level to Olympic medallists. The venue at Saga Prefecture Yacht Harbour is the same as will be used for this year’s 420 Worlds, offering a great opportunity for coaches and sailors to also familiarize themselves with the racing area. Led by renowned 420 Coach Steve Keen (USA), the clinic covered the fundamental role of a coach, alongside the on water sessions, training techniques, sports science, and racing rules. Boat preparation, tuning, boat handling and race strategies were also discussed. "Each of the coaches took something slightly different away from the clinic," said Keen. "Some coaches gained a better understanding on sailing techniques, while others gained a lot from the on the water training with the sailors regarding immediate feed back while during the drill and how to teach the sailors different technique both on the water and off the water. "I feel the largest area the coaches gained was in learning to create a dialogue with the sailors, so as coaches we aren't always lecturing our sailors, rather we have a conversation, or questions and answers with the sailors so we make sure they understand the concept or idea we want them to learn." The 4-day clinic was broken into two phases. The first two days were spent in the classroom, focusing on theory and boat familiarization on land. The second two days saw the coaches split into groups of 3 coaches, and working with the fifteen 420 teams to prepare a training plan for their sailors. This included briefings, land drills, on the water drills, racing and debriefs. Keen explained the planning of the four days, "The clinic gave the coaches a lot of new ideas on not just boat tuning, boat handling and strategy, but on how to teach the sailors in a way that we cover all their learning styles to make sure all sailors gain the information they need." Asia continues to see a growth in 420 sailing and by increasing the level of coaching in Japan and other Asian countries more sailors will get good information at the time they need it. "This will allow for new and more success," said Keen. "Currently, there is a lot of growth in Japan for the I420 Class. 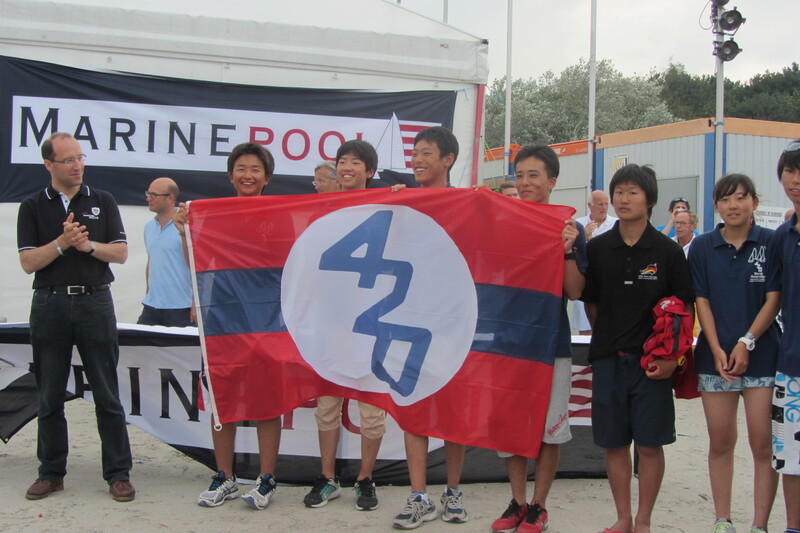 There have been a number of changes within the country, namely the change to use the I420 Class as the class of boat for the Japanese High School National Championship which has helped renew a lot of growth in youth sailing in the I420 Class in Japan." The Coaches’ Clinic benefited from a mix of weather conditions, enabling the coaches and sailors to challenge themselves in everything from heavy wind to very light and shifty. With just three months to go until the 2015 420 World and Ladies World Championships, it was a great opportunity to see first-hand how preparations are going. "The Japanese Organizers for the 2015 Worlds are right on target to run a great event," complimented Keen. "They were making significant changes to their facility while we were in Karatsu. "There's going to be lots of space for all the sailors at the facility with a super large launching ramp to get on and off the water. Everyone I met in Japan is excited to be hosting the 2015 420 Worlds later this year, and going out of their way to make sure it is a great event. "The racing area is going to be close to the beach, which will be great for spectators both locals and support teams from other nations. While we were in Karatsu we had great wind and after talking to the locals that sounds indicative of what we can expect in July for the World Championships," Keen concluded.